OLD PARKED CARS. : 1968 Chevrolet Chevelle Concours Hardtop. 1968 Chevrolet Chevelle Concours Hardtop. That's actually a '68 (confirmed by cheesy front license plate frame). Were these any good? Concours doesn't scream handling or speed upgrades. Great to know that such a time capsule exists for a model I'd never heard of. Let me tell you guys what a "Concours" was. 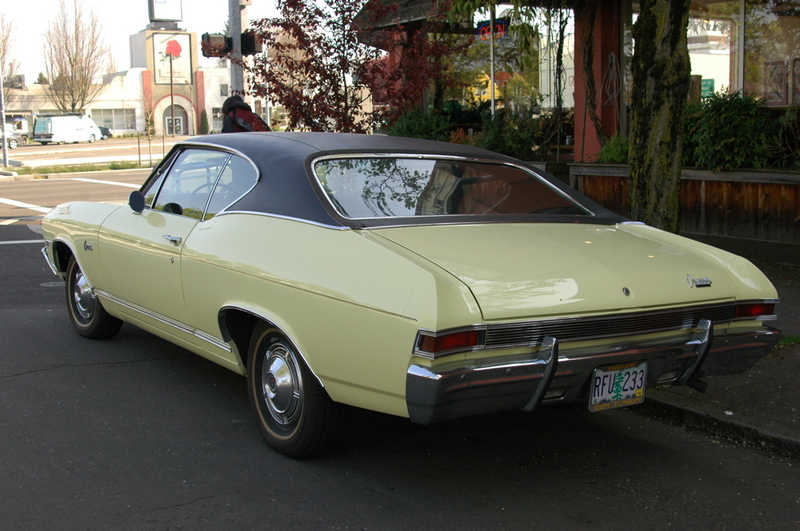 The Concours nameplate debuted in 1967 as the top of the line Chevelle (Malibu trim) wagon... Simply put, it meant it had walnut woodgrain styled sides. Many of the Concours wagons in '67 because they were the top of the line, were typically fitted with long lists of options not usually found on the lower Malibu, or lower yet, 300wagons... Par for the course. In '68 the Concours line became the top of the line 2/4dr hardtop (aka "sport sedan", ie NO CTR POST) complete with its own Fleur d'lis design appointed interior... To show the public that you had spent xtra on this model it was equipped with the appropriate badging, and a unique to the model rear 'ribbed' trim panel between the tail lamps. Once again, in 1969, the model changed again, going back to its original guise... The top of the line woodgrain trimmed wagon, and became known as the "Concours Estate" wagon. It was carried out through the 1972 model year. 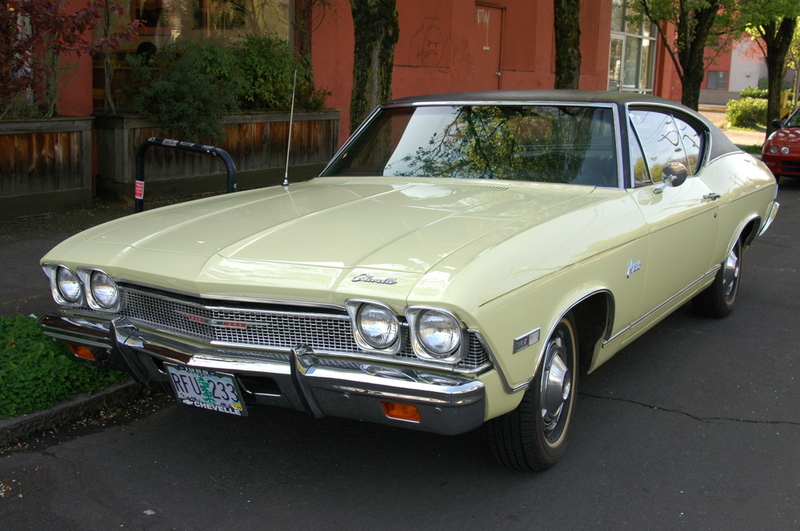 Check them out... A 1967 Chevrolet Chevelle Concours is a very desireable car as it was the first year... Same on a 1968 model Concours... First year. The rest are special inasmuch as they are the top of the line wagons of the midsized platform. There's your information Gentlemen! Now go Google!! ...Additionally, if you want to see one (albeit a bit pricey!!) for sale right now (JULY 4 2011) that once restored to its original glory would be an AWESOME treat to the EYES (most likely only to Station Wagon nuts... the rest will just have 'a high appreciation' for!!) -- Go to Ebay... There is a Mountain Green model (code HH on trim tag on cowl panel) which originally of course had the walnut sides but long ago was removed, or bleached by the sun (these cars have to spend their lives in garages, or else!! Kinda like owning a convertible and parking it outdoors, Duh!).. Anyhow, the one on Ebay was like I said in the blog cmt above, highly optioned... It has the original factory tinted glass all around (which definitely is a clue that the car came equipped with AC) and also had PS, PB, CLOCK, AM/FM (that site mentions it as 'long gone') along with the factory original 8 TRACK player (also 'long gone'), and accessory roof luggage rack... Not all Concours came with this I can tell you. If I had the bucks (I don't right now) I would go buy that guys car. He is in Pikeville, NC... 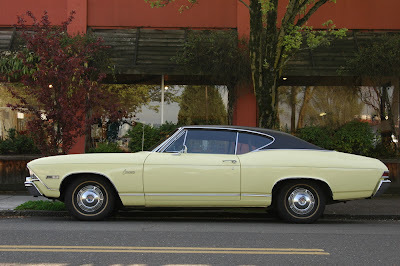 I used to have a Mountain Green Malibu 2dr hardtop with the 'optiional 6' (250ci, 4.1 litre L6 [in line 6])... Standard was 230 cube in '67. I miss it, but would love to have a Mountain Green Chevelle Concours!! My parents would flip if they saw that parked out front... They would know for sure who had just arrived. One day I would like to do that... Come home to my parents house in a car that they would know for sure was ME again... IT has been 18 years since I had my green '67 Malibu... We all lament the 1960's cars we USED TO have!! Somehow, I do not see anyone lamenting anything after that!!! I goofed guys... Concours was a 2/4dr hardtop model in 1968 and 1969... 1970 was when Chevrolet resumed its production as a station wagon.